The best quality, most unique features and excellent handling make the camera series VarioCAM® High Definition an indispensable tool for professional users. The individualization options for features enable optimal use in all situations. 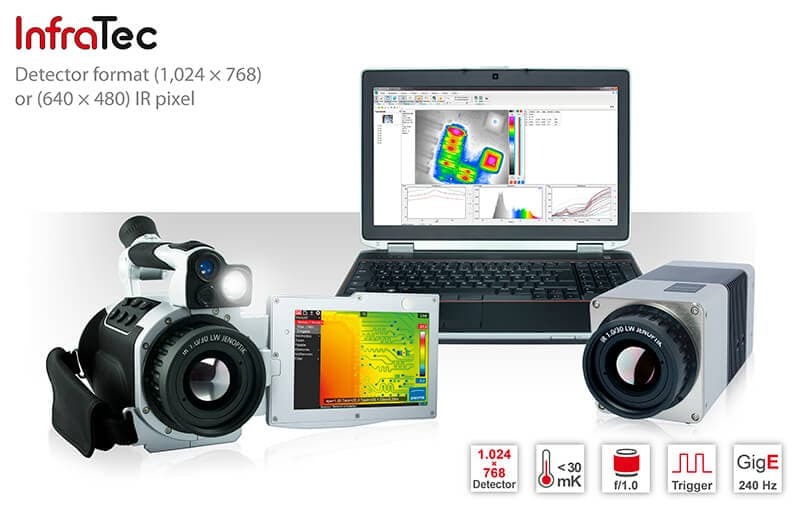 For example, with this thermal imaging camera, the thermal behavior of PCBs can be documented either as a snapshot or video, allowing for fast and secure data analysis. The heart of this camera series consists of two variants of high-resolution microbolometer detectors of the latest generation (640 x 480) or (1,024 x 768) IR pixels, which, in combination with the innovative opto-mechanical MicroScan unit, delivers real temperature readings that are 4 times as accurate as the native detector resolution. Depending on the detector format, geometric resolutions of up to 3.1 Megapixels can be achieved. In combination with the extensive range optics with high-macro and microscope optics, even the smallest structures and defects can be seen with pixel sizes of up to 17 microns. The extremely high thermal resolution of this innovative camera technology ensures that even the smallest temperature differences of objects even less than 0.03 K (30 mK) are reliably detectable. Dynamic processes can be analysed and documented with frame rates of up to 240 Hz. With the unique "EverSharp" function, object structures always remain in focus within the image scene, regardless of the depth of the optics-/aperture combination used or the distance of the object to the camera.